The Dallas County Board of Supervisors convened Tuesday morning in regular session. Much of the meeting was devoted to the canvass of last week’s primary election. 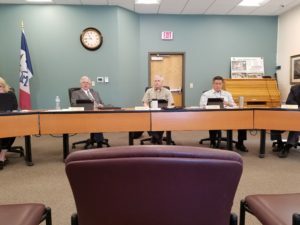 County Auditor Julia Helm explained that the winners of the election are the nominees chosen by the individual parties to vie for the available offices in the November general election. The election was successfully canvassed, so the results are now official, and there were no changes from the initial results. In addition to the canvass, the Board also approved two items concerning the new law enforcement center. The first was the final acceptance for completion of the site grading bid package, which was recently finished by McAninch Corporation. The second was a payment to U.S. Erectors in the amount of $81,890.84 for metal work, which was added to last week’s pay application submitted by the Samuels Group. Other items approved included: changes to the employee handbook related to health care benefits as presented; two different rezoning requests; changes to the County’s general assistance ordinance; an operating transfer from the General Fund to the Ortonville Lagoon Operating Fund; and an appointment to the Adams Township Clerk position. The Board also approved a request to use the courthouse lawn for the annual Iowa Prayer Caucus Network event, to be held July 14th through 15th.